Casino Night to benefit the Boys & Girls Club of the Northern Neck will be held March 2 at Chesapeake Academy, 107 Steamboat Road, Irvington. This change in venue comes about as a result of the club’s November fire, reported publications coordinator Tina Hagen. While the Activity Center in Kilmarnock was not affected, it is now the only after-school program site for fifth- to 12th-grade club members and must be available to them during the period required for Casino Night set up. The event will begin at 5:30 p.m. and will include electronic horse races, poker, Black Jack, Roulette, Texas Hold ‘em and raffle prizes, said Hagen. Guests each receive a packet that includes casino chips, prize tickets and one drink ticket. Heavy hors d’oeuvres and a fully-stocked cash bar are provided. Black tie is optional. Group Dynamics Entertainment of Richmond will provide the entertainment—as well as DJ David Sporn. He comes highly recommended for his ability to create a charged atmosphere and provide dance music and favorites from any genre, said Hagen. From games to dancing, there will be something for everyone—right up until 10 p.m.
Casino Night is one of two major annual fundraisers for the Boys & Girls Club that support both Lancaster and Northumberland clubs’ after-school and summer programming. 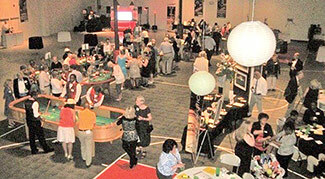 “Casino Night is not only a fun event, but also a way to thank our supporters and share an entertaining evening together,” said executive director Phillip Mumford. Tickets are $50 and may be purchased at bgcnn.com.